In a blacked-out basement during a bombardment at the peak of the Iran-Iraq war, a man began to shave his brother-in-law’s long dervish beard. When the raid ended and the lights flickered back on, half of the man’s face was unshaved. Born in 1979 amid a revolution, and with a war with neighboring Iraq to come, Ali Chitsaz has heard his share of war stories such as this one. Those experiences, sad and darkly funny at once, often find a home in his work. In his latest show at Tehran’s Golestan Gallery, the young painter captured that same spirit, with aesthetic influences ranging from Persian miniatures to Qajar photography. 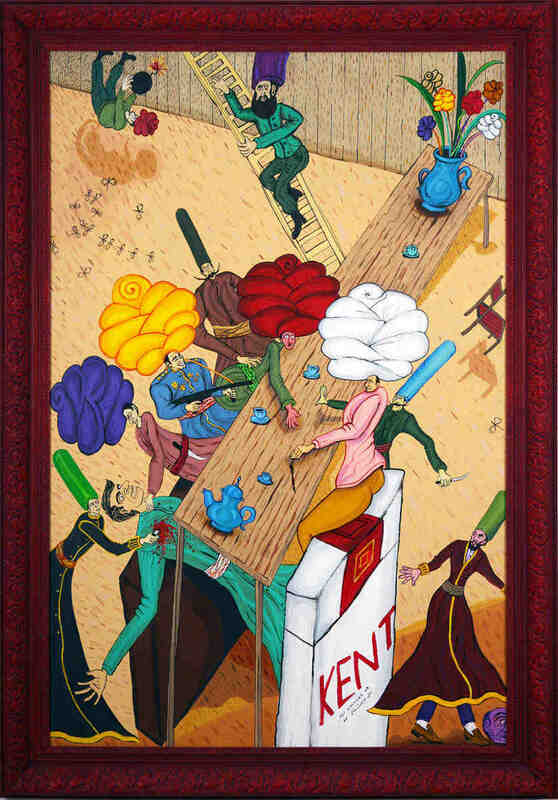 The seventeen canvases on view at Tehran’s Golestan Gallery in this first solo show were painted in cheerful colors. Their naive style, complete with distorted dimensions and gawky perspectives, resembled that of traditional Iranian ghahve-khane (coffeehouse) painting. And they were funny. In The Invisible Rainbow (2007), one of many men in enormous turbans sat on an even larger Kent cigarette box; the turbans’ shape was repeated in a bouquet of flowers depicted in the upper-right-hand corner of the painting. The latter motif was also taken up in Camouflage (2008), in which two bearded and turbaned men, holding leaves in their hands, disguised themselves in a flowerpot. The figures in The Battle of Mamasani (2008) shot and stabbed each other behind the giant crowned head of a Qajar king. While the artist at times seemed satisfied with a cheap laugh, Chitsaz generally avoided falling into the realm of simple caricature. His attention to the nuances of Persian art history was impressive; his chaotic battlefields, for example, owed much to the great fifteenth-to-sixteenth-century Herat School painter Kamal od-din Behzad — a sea of galloping men, hands holding weapons, chopped-off heads. A man or two stared out of the canvas, gazing straight into the eyes of the viewer, and you felt as if you had been caught witnessing a massacre you were never meant to see. At times, Chitsaz’s turbaned men evoked Ottoman sultans or Muslim clerics, and his works mixed men in the dress of the Safavid (1502–1736) and Qajar (1794–1925) dynasties. Indeed, some of his figures appeared to have come straight out of Qajar-era photographs of the shah, clerics, and infantrymen posing with furious miens. Chitsaz came off like a mutinous artist who, bored with making portraits of the ruler, secretly paints loonies and vagabonds on the streets without the shah’s permission. While coffeehouse paintings and miniatures illustrate well- known stories such as the Shahnama (Book of Kings), Chitsaz’s works told a story of his own imagining, an occasionally violent, often absurd world that served as a poignant metaphor for the times. The paintings at the Golestan exhibition were hung in the sort of faux-rococo gilt frames one finds in downtown Tehran semsari (pawnshops), giving gallery visitors the sensation of walking into a nineteenth-century kakh (palace), decorated with recently dusted oils. But these frames, like the artworks themselves, pointed to one of the dilemmas of contemporary Iranian painting, and Iranian visual art in general: the work — as technically strong or, in this case, visually appealing as it was — dwelled in the past, using it as a pat metaphor for the present. While this trend has met enormous success in the art market recently, one hopes that younger artists will deviate from what has become a formula, daring to fashion new vocabularies for the present.